Nicholas Roerich spent many years with his family on an expedition to the east of Eurasia. They visited many countries: India, Tibet, China, Mongolia. But most of all, the artist was shaken not by the city landscapes, but by nature. The work “Temple in Naggara” is the glorification of man-made and natural art. In this work, we see a large temple surrounded by mountains. For followers of Hinduism, this place is revered shrine. Lost deep in the mountains, the temple of Tripura Sundari, to any pilgrim will seem like a real gem. The building is located in the north of India, in the small town of Naggar. Roerich portrayed Tripura Sundari as if we were looking at him from a high mountain. This mountain is not visible, but from it we can consider all the details of the Hindu temple. The building consists of a three-tier acute-angled roof. This method of building temples is very common in India. Around the building we see several smaller houses, in which local monks probably live. All houses and the temple are surrounded by a high fence. But the temple protects not only the erected fence. The main watchmen are the majestic Himalayas. 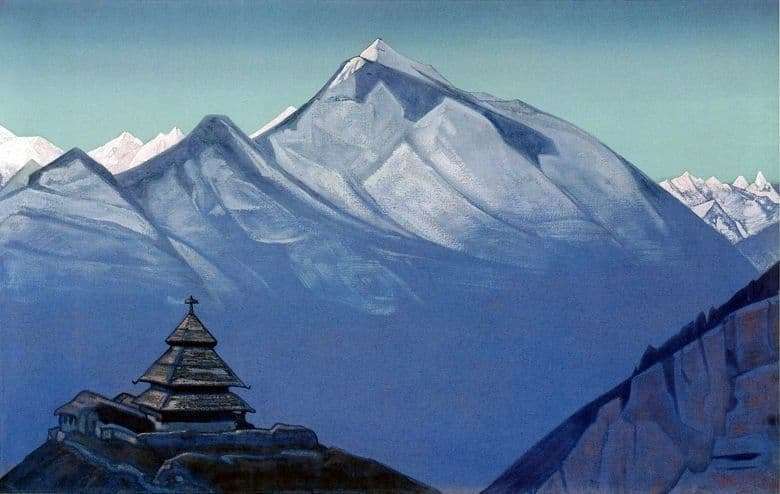 Roerich traveled extensively in the mountains during his expeditions. Himalayas became his favorite place and eternal source of inspiration. Behind the temple is a high mountain range. The artist chose to use an extremely cold range of colors when working on this picture. It is very difficult to understand what time of day the artist depicted. At first glance, it may seem like twilight. The sun has already gone beyond the horizon, but the mountains still hold a charge of solar heat and glow from the inside. But this impression is deceptive. If you look closely, you can see that the snow-white mountains in the background shine in the sun. Snow peaks reflect light and give bright colors to the work. Probably, the artist depicted earlier morning, when the sun just a couple of hours ago seemed in the sky. Some of the rays have already lit up the mountain range, but the small temple located on a low mountain has not yet received a well-deserved light.